Con grande soddisfazione annunciamo che è stato pubblicato il volume: “Chiave per il riconoscimento delle larve delle specie italiane delle libellule (Odonata)” a cura di G. Carchini. Si tratta di una nuova versione della chiave pubblicata nel 1983, con l’aggiunta di nuove specie (ora 86) segnalate per il territorio italiano negli anni passati. Il libro è in vendita a 10 € a copia più spese di spedizione. Per i soci di Odonata.it il prezzo è di 5 € a copia più spese di spedizione. Sconti per chi ordina più di 10 copie. 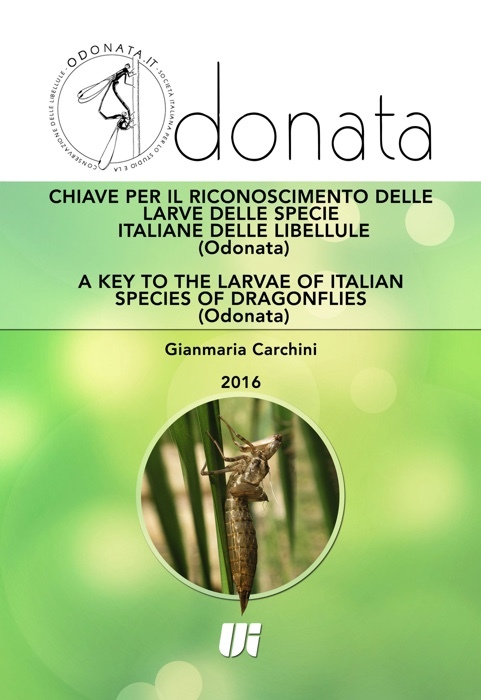 It is with great pleasure that we announce the publication of the volume “A key to the larvae of Italian species of Dragonflies (Odonata)” by G. Carchini, released in Italian and English. In this edition a new key for the Italian dragonfly larvae is presented, previously published in 1983. The reason that justified this new edition is the opportunity to: include some species newly present in the Italian odonate fauna; to critically consider the publications published in the meantime; finally, to correct some imperfections, to be attributed to the inexperience of the then young author. In the new key 86 species are considered, of which six not present in the edition of 1983; additionally, for four further species characters useful for determination have been given. New characters have been added, also based on the color, in vivo, and aided by some color photographs. The volume is on sale for 10€, plus delivery costs. For Odonata.it members the price is 5€, plus delivery costs. Odonata.it offers a discount for those who will buy more than 10 copies.